One of the Latino stereotypes that I believed when I came to Honduras was that that Latinos, in general, placed more value on "family" than some other groups of people. While it is true that many, many Hondurans love and protect and care for their children to the best of their abilities, it seems that every year there are more and more who discard them when the next woman or man comes along who catches their eyes. In my first few weeks and months here in Honduras, it seemed that virtually every woman I met had a child, or more than one, and no husband. In some cases the father of the children was gone to the U.S. and was sending money to help support them, but in most cases the father was just not in the picture and had never been. I've met many adults who have never known a father, who now have children who have never known a father either. A personal story that I can relate involves a 4-year old girl who was offered to us as a "regalo" (gift). The girl's father was gone to the U.S. and her mother was pregnant by a new boyfriend. The boyfriend said that he would take care of woman and his child but he didn't want another man's child, so she had to "get rid of la niña" (the girl). This was all relayed to me as if it was a perfectly normal circumstance and an opportunity for the mother to better her life. After talking to several people about it, I found that it was, indeed, an everyday occurrence and not considered shocking at all. The following article is reprinted with the permission of the author, who has many years experience with helping families and children in Honduras but who has asked to remain anonymous because of dealings with Honduran government officials and courts. 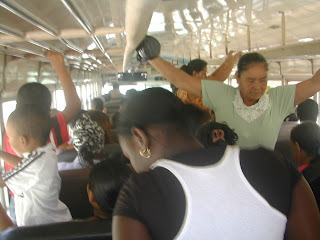 In Honduras, 50% of the population is 15 years old and younger (as of January 2006). The average woman in Honduras is only 15 years old when she gives birth to her first child. In 2006, 80% of all birth certificates issued did not name a father. The reasons for this lack of family structure in Honduras include: large number of men (and increasingly women) leaving for the United States and Spain; high unemployment and underemployment; overall failing of the moral structure of the society in that there is no longer any stigma to having a child outside of marriage; lack of education; lack of a loving, supportive environment within the family which leads to young women having babies in order to have someone to love; macho attitude of wanting to have as many children as possible by as many women as possible. Hondurans (in lower economic levels) tend to think of children as financial assets, rather than as liabilities. In the US and Europe, and among upper classes in Honduras, it is understood that having a child entails a level of financial cost (education, food, clothing, etc.). The poor tend to think in terms of a child as a financial retirement plan... the child will be expected to support the mother when she is too old to work. 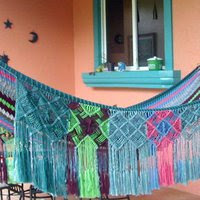 Maquilas generally will only employ women from the age of 18 through age 30. At 30, women are considered too old, too slow, and are dismissed. So if a woman in Honduras has her first child when she is 15, by the time she "retires" her child will be ready to start working. Most women over 30 tend to sell tortillas on the streets or do other things from their homes rather than work in a company. They rely on their children to work and provide for them. This attitude leads women to want as many children as possible. The consequences of the lack of family structure include child abuse. This abuse, especially sexual abuse, is the most common problem. Men who are not related to the children in the home feel free to use them sexually. Women are hesitant to file police reports or try to protect their children for fear of reprisals from the men, especially physical violence (now estimated to be common in more than 30% of all homes) and abandonment. Serial "marriages" are common with three or four men coming into the home over the years and fathering their "own" children. This leaves the other children at great risk of abandonment and abuse. In addition, there exists a very weak legal system in Honduras, a lack of police in the communities, a high level of violence, few options for the courts to place abused children in safe environments, and pressure from the government to return children to their families so as to not present statistics to the international community that reflect the true situation of the children. Each time a child is removed from the family unit, the "count" goes up on the problem of children at social risk, and the "image" of Honduras is damaged. 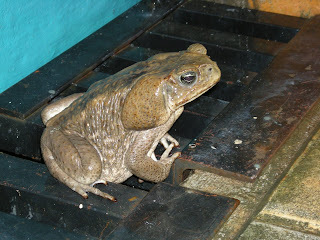 Our friend Bufo is back. This photo was taken on the canal in front of the garage, but the last time I saw him he was back on the front porch surrounded by dogs and the occasional chicken. That makes me very nervous after finding out that this is a poisonous toad. I chased him off the porch with a broom. There are so many dangers here. We had a scary night last night. Chloe kept barking and barking. About 7:30 p.m., El Jefe got the gun and went outside to see what the problem was. Meanwhile, a neighbor came around to warn us that a home had been burglarized, that the police were there (!? 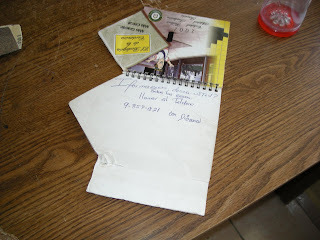 ), and had captured (!?) one of the thieves. The other(s) had escaped and were thought to still be in the neighborhood. So El Jefe kept the gun close by, but Chloe continued to bark. He went outside to check it out. (Why, oh why does he have to do this? I would much prefer to stay inside and just shoot anyone who breaks into the house.) 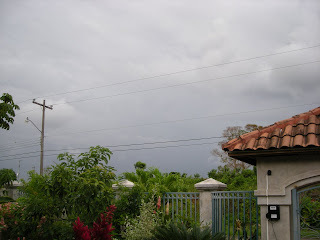 He found that Chloe was barking at the top of the muro (fence), where El Jefe could see an animal. 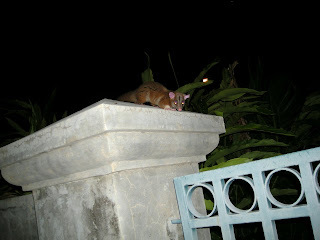 He said that this animal is called a comadreja (weasel). Weasels eat eggs and even kill chickens and that is probably why he was braving the vengeance of Chloe the Rottweiler. I googled "comadreja" and from there, Mustela nivalis. I found photos that looked like cute little ferrets, not like this animal. From there I researched Mustelas further, Didelphidae, and Marmosas, but none of these looked quite right. 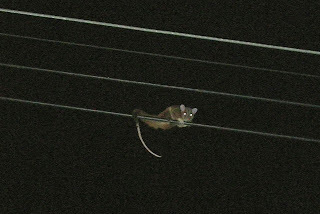 El Jefe shot an opossum one night, but it looked different − more pointy-faced, grey, and sort of bald looking. I was just about to give up when, finally, I found the Caluromys derbianus, or Woolly Opossum, native to Central America. I think that is what this animal is. 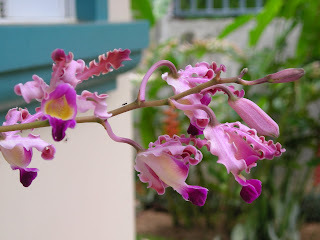 It is native to both highland and lowland forests from Mexico to Ecuador. The coloring of the woolly hair can vary by location but the distinctive dark stripe running from the top of the head to the fleshy part of the nose is characteristic. This Belize site (in Spanish) says that the Oposum lanoso (woolly opossum) will eat rodents, raw eggs and dog food (is this where all the dog food is going?) among other things, such as fruits and insects. Animal Diversity has much the same information in English. In the past this animal was trapped for its fur. Now it is on the IUCN's list of threatened species due to habitat destruction by humans. This report says that the Caluromys derbianus population is rated as "uncommon to locally common" throughout their extensive range so I don't know what the status is in Honduras. I do know that if it attacks our chickens, the population will be one less. 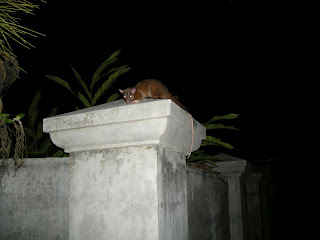 Later in the evening, El Jefe invited me to come out and see the new moon. I stepped on the terraza and he said that I would have to come out further to see it. 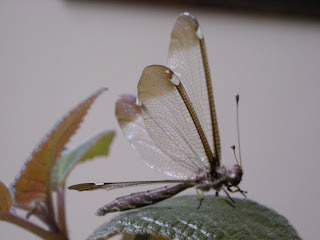 I went out in the yard and just then heard someone/something racing toward us through the leaves of the plants. I screamed and practically climbed on top of El Jefe's shoulder. One heart attack later, and Chloe came rushing at us. I ran inside and locked the doors and windows. to carry it to Switzerland and deposit it in my name! Charles Ford, US Ambassor to Honduras, recently declared that because of the high incidence of corruption and personal and judicial insecurity, very few North American investors are coming to Honduras. "One person, one fiscal, or the Supreme Court of Justice can not resolve this problem. 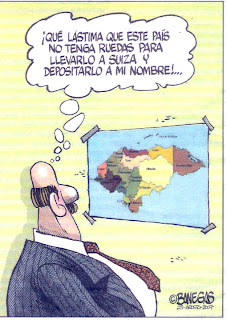 What will resolve this problem is the society of Honduras." In the past six months, the Tribunal Superior de Cuentas has documents irregularities in the management of L.2 billion (US $106 million). Another exciting day in La Gringa's house. We had the window screens open to capture a little more breeze. Later I heard a flapping noise. 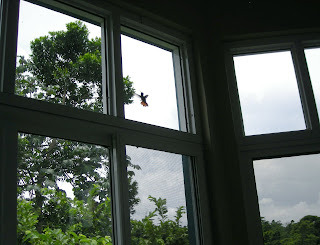 Going to investigate, I found this hummingbird desperately trying to get out the closed windows. I couldn't get a much better look at the hummingbird in person than is shown in the photo. The only thing I could see clearly was the brightly colored tail. I think it was a Rufous-tailed hummingbird, because, well, it had a reddish-brown tail and they are known to be in this area. Daniel from Hondubirding is probably cringing at my identification. I have to apologize for the quality of the video. First, there was the problem that the light was bright outside the windows. Then there was the problem of filming with one hand while rescuing with the other. Anyway, now if you ever have a hummingbird or any other type of bird trapped in your house, you'll know what to do. In a pinch, a broom can be used instead of the duster. First a word of warning. If you are one of those people like me who is disgusted by those sappy women on TV whose happiest moment in life is to have a sparkling toilet, you might want to change channels right now. The reason? Sappy La Gringa has to share this happy moment with you! I'm humiliating myself only in hope of helping someone else who has bad water like we do. I also want to say that I was prepared to live with this problem. 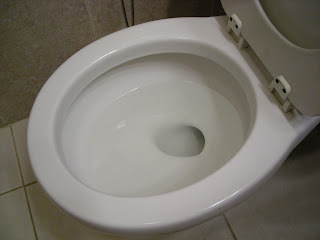 After all, lots of people have bad water and I've seen some pretty bad looking toilets. 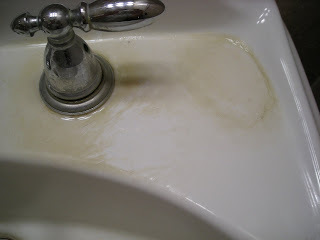 Many toilets are completely ruined from trying to scrub away the mineral deposits with harsh chemicals and wire brushes. It was El Jefe that couldn't stand it anymore. I tried every toilet cleaner available at the stores. The toilet laughed at my attempts. I tried vinegar, purple stuff, blue stuff, bleach. It snickered. I tried home remedies like citrus oil, lemon juice, Coca Cola, and Tang powdered drink. The toilet said "Yum, give me more." I got tough with CLR, LimeAway, and acetic acid. Pffft. Nothing worked. Where else to turn but my old friend Google? A search for "clean bad toilet" gives 2,930,000 results so I'm certainly not alone with this problem. I spent hours and hours reading about recommended products that I can't buy here. Home remedy suggestions were sissy things like adding a cup of vinegar or mixing 4 tablespoons of baking soda in a a quart of water. Hah. As if. 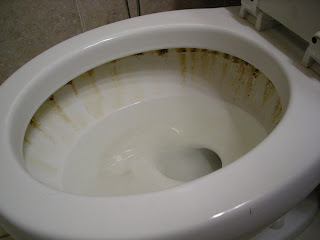 I read about toilet tune ups and disinfecting toilets. I was sidetracked by ghost flushes, phantom flushes, and whistling toilets. I read about dangerous chemicals and the need to wear a face mask and safety glasses. I got my PhD in toiletology. But the real cleaning experts are at GardenWeb and Thrifty Fun. Finally, I read something completely new to me that sounded like it made sense. Pumice stone. You can read about pumice stone on Wikipedia. Pumice stone is light. Here is a big one standing on top of a curled up lempira bill. It's not a trick photo. Pumice is so light and porous that it floats on water. 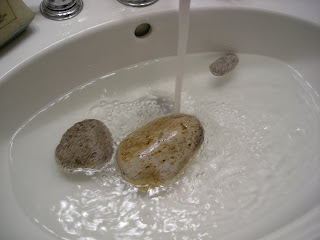 Now rubbing a rock around the inside of the toilet may sound as strange and dangerous to you as it did to me, but remember that I was desperate. 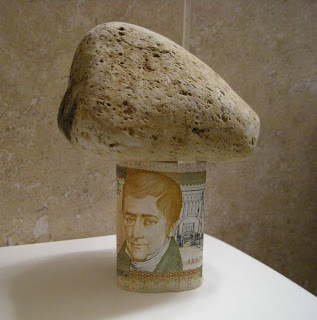 I moaned to El Jefe that we needed a pumice stone. He didn't know what a pumice stone was but when I described it, he said that he knew where to get one. It worked so well that I thought I would try it on the sink. 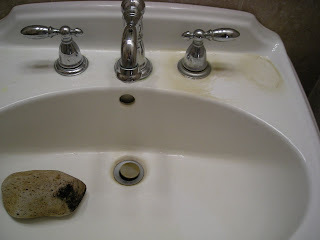 This sink was so disgusting and worst of all, it is in our guest bathroom, too. I was ready to buy a new sink so I had nothing to lose. 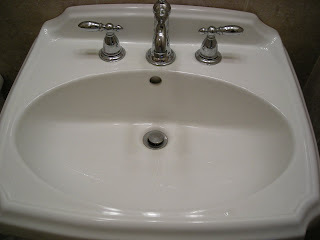 It doesn't sit properly so the water sits in areas instead of draining into the sink. I've tried all the products mentioned above, plus I even tried the no-no of using Ajax out of desperation. I thought the finish was permanently damaged. Is it just me, or is this funny? El Jefe was waiting for the bus on the highway. A skinny, poorly dressed woman with a young child approached. They had ridden a bus a long way from up in the mountains to meet someone who they couldn't find. She asked El Jefe to try to use the cell phone that she had bought for the trip to call the number she had written on a scrap of paper. El Jefe found that she had no saldo (minutes) on her phone. 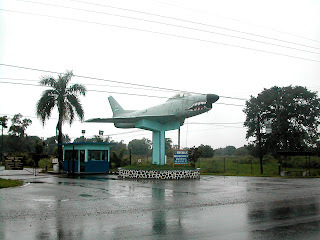 El Jefe's brother J needed an auto part that wasn't available in La Ceiba. He called a company in San Pedro who had it in stock, available for L.700. His choice was to make the 5-6 hour round trip or deposit the money directly into the company's bank account, which he did. He called the company to tell them that the deposit had been made and faxed a copy of the deposit slip. The clerk said, "Oops. That part is L.1,500." Knowing that he was stuck − it is virtually impossible to ever get any money back from any Honduran company, even if they don't even have the item that they just "sold" to you − he deposited another L.800 and called again. The clerk said, "Oops. We made a mistake, that part is L.2,600." So, what can he do now? Now he is in for L.1,500 and can't afford to throw it away. So he made another bank deposit for another L.1,100. When he called, they said, "Which part do you want? We have three different ones." The part was sent and luckily it was the right one, even though J paid more than three times what he was told it would cost. So much for price shopping. Our former worker Carlos was bringing us some banana plants. He normally rides his bicycle everywhere but the plants were too heavy to carry on his bike. Carlos is skin and bones, and although he dresses neatly, he is obviously poor and from his language, it is easy to tell that he is from the mountains. It's things like these...well, what can I say? Why do so many people who have just a tiny bit more power over others take advantage instead of offering a helping hand or at least just being fair with those less fortunate than themselves? There is so much truth to the Honduran proverb that I wrote about in my first month of blogging. These stories also show why so many Hondurans have little or no trust in other Hondurans − a whopping 93% according to a recent National Transparency survey. You may say it is a cultural difference. I say it is a reflection of the deterioration of the culture. In any case, it is a cultural difference that I don't plan to adapt to. 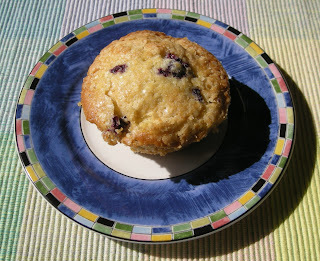 As surprising as this may seem, blueberries are grown in Honduras. I don't know for sure, but I think they are grown in the cooler mountainous areas and mostly for export. They grow the large rabbit eye blueberries that are grown in Texas. Blueberries are rare here in La Ceiba. We've only seen them at the grocery once before. Another time a neighbor whose uncle grows them for export gave us a couple of gallon bags. Boy, was I happy! We shared some with our workers who had never seen blueberries before but really liked them, too. I hoarded the rest for months in the freezer. A couple of weeks ago, El Jefe happened upon some at the grocery store. He brought a large carton home and we played a guessing game about how much they cost. I guessed L.100 (US $5.29). He pointed his thumb down. I guessed L.60. He pointed his thumb down. I guessed L.40. He said L.25! "L.25 and you only bought one carton?!!!! I would have bought them all!" I cried in dismay. The next time we went to the store, they still had the cartons, but the berries were all watery and rotten. What a disappointment! To top that off, probably now the manager thinks they won't sell and he'll never stock them again. Boo hoo! I'm dying to get some blueberry plants to try them here. My soil is certainly acidic enough. It may be too humid but I sure would like to try them. I asked my neighbor if I could get some plants from his uncle but never heard back. He's probably afraid that I will go into competition with him − Not a chance! I'm keeping all my blueberries. Before I moved to Honduras, blueberries were my favorite fruit. Now I would have to say that mangoes are my favorite but that doesn't mean that I still don't love blueberries. 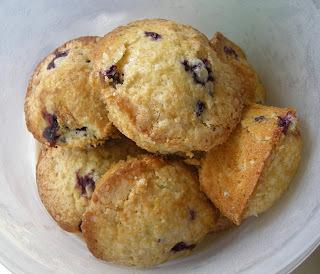 I doubled the recipe but only used two cups of blueberries because that was all I had left. Bonus tip: Blueberries freeze very well. The key is to not wash them first. Freeze them in plastic freezer bags and wash them as you use them. That way not only can you pour out just the quantity that you need, but the skins don't get tough as they do when they are washed before freezing. 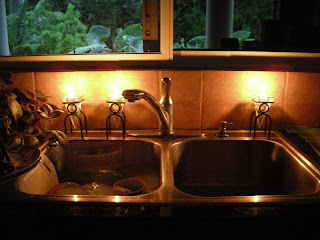 Washing dishes by candlelight. What could be better? Anyhow, let me enjoy this! 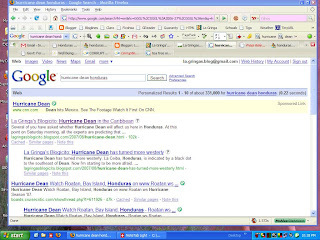 Google 'Hurricane Dean Honduras' on August 21 and you'll see La Gringa's Blogicito as the number two and three entries right after CNN! Whahahahah. And I didn't even have any of that exciting video to show. Drat! Maybe next time. 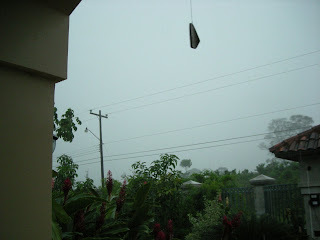 La Ceiba after a rainstorm. 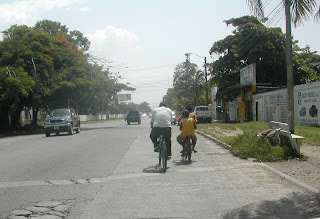 These are some street scenes from La Ceiba, Honduras, yesterday. Now before you start thinking that we were hit by Hurricane Dean, let me assure you that we had no more than an hour of heavy rain. Rain no heavier than we get a zillion times per year. In one nice neighborhood, Colonia Toronjal, some of the streets get the water knee-high after every rain, hip-high after a really good rainstorm. We almost bought a house there but told the seller we wanted to see the house during a good rainstorm. Best decision we ever made! The storm drain lines are clogged with trash, especially plastic bags and liter plastic Coke bottles. So the sewers fill up with water that has nowhere to go and then they spit it back out again. The drains have been like this as long as I've been in La Ceiba and I'm sure many years before that. Every time it rains, people complain but continue to throw their trash wherever. The municipalidad (municipal government) promises to clean out the lines every now and then, but mostly it's just lip service and pointing fingers. I took this photo in the Zona Viva, the tourist restaurant/ nightclub/bar/ prostitute area, last September after another hour's rain. 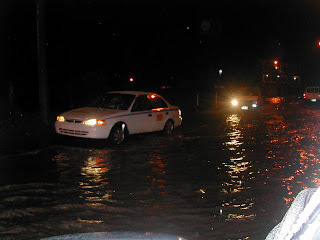 We saw whitecaps in the street that night! I'm so proud! This is my first time ever to buy an orchid and maintain it until it bloomed again. I'm sure that the hot, humid weather here has a lot to do with my success. 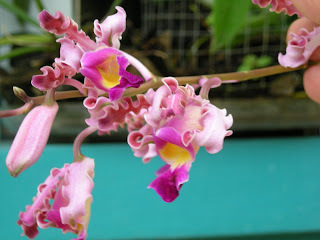 I bought four orchids back in March when we made that trip along the Cangrejal River. One was blooming when I bought it so I suppose it won't bloom again until next year. The other two haven't bloomed yet but they are still looking reasonably healthy. 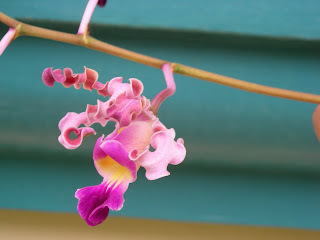 I took these photos on June 27 and today there is still one small bloom at the tip. Talk about long lasting! 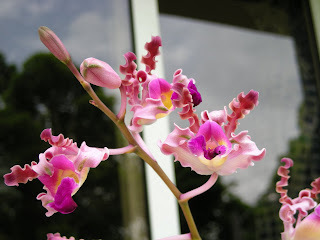 If any of you orchid lovers out there can tell me the name, I would appreciate it. I couldn't decide which photo was the best, so I just posted all of them. 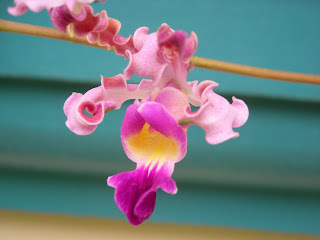 Update: Reader Fred has identified it as Myrmecophila tibicinis, which I see is also sometimes called Schomburgkia tibicinis. 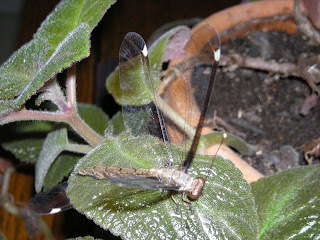 He also said that this plants usually hosts colonies of ants in the pseudobulbs. He sure has that right! This plant and its container have been covered with ants since I got it. Thanks, Fred! La Ceiba, Honduras, is indicated by a black dot to the southeast of Dean. Now I'm starting to be more afraid. Hurricane Dean, which was predicted to hit the Yucatan and the northern part of Belize has turned from its northwesterly trajectory to a more westerly direction. 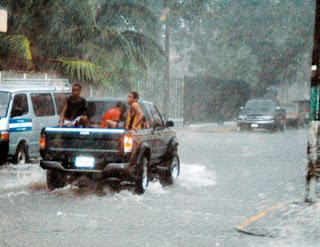 It is predicted to reach category 5 (the highest) level as it passes to the north of Honduras. It appears that Belize will be hit straight on. Photo about 1 p.m. Monday. DEAN IS EXPECTED TO PRODUCE STORM TOTAL RAINFALL OF 5 TO 10 INCHES OVER THE YUCATAN PENINSULA...BELIZE...GUATEMALA...AND NORTHERN HONDURAS...WITH MAXIMUM AMOUNTS OF UP TO 20 INCHES. THESE RAINS COULD CAUSE LIFE-THREATENING FLASH FLOODS AND MUD SLIDES. Photo about 1:30 p.m, Monday. The most surprising thing about hurricanes to me is how slow they move across the ocean. 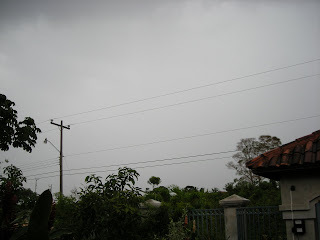 We are currently (3 p.m. Monday) experiencing very heavy rains, lots of thunder, but not much wind. The power has already blipped off once, so I wouldn't be surprised if we will be without power (and internet connection) at least part of the day or night. So if you don't hear from me, it doesn't necessarily mean that we are in the hurricane. I'll update this article later, if I am able to. Update 10:00 p.m.: All is calm and quiet. The rain has stopped. We have power. We have electricity. It seems we are going to be lucky tonight. 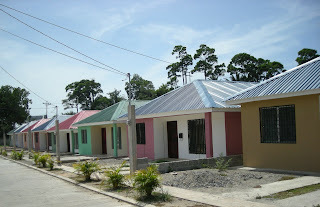 Someone on our Honduras Living group was asking about a new housing development she had seen on a trip to La Ceiba. She said it was next to the Aguazul water plant. I couldn't find anyone who knew where a Aguazul water plant was, but someone mentioned the place on the highway where they bottle Pepsi, Aguazul, and other drinks. And there happens to be a new development next door. Well, it turns out this is not the place she was interested in, but since I went to the trouble to take a bunch of photos and ask around about prices, etc., I thought I would show it to you. 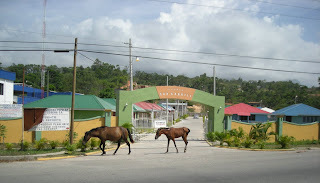 It is called Residencial San Gabriel. 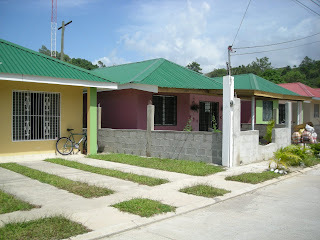 "Residencial" used to mean a more upscale development than a colonia, usually with larger lots and custom homes. As you can see from the small cookie cutter houses, the word is being used a little more loosely now. 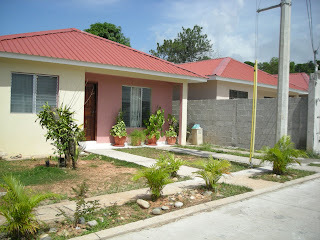 The first thing that I noticed about this development was the bright colors and the attractive entrance and muro (fence). I really like them. Next I noticed the cookie cutter houses, each one exactly the same. I've seen other developments like this and wonder why they can't at least use two or three different designs or a little bit different style on the exterior, but over time, the houses will look very different with different styles of muros, gardens, and ironwork. Driving through the development, we were amazed to see an open house sign. 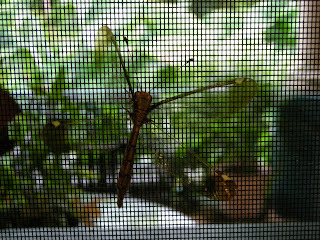 El Jefe and his friend were a little leery about me going in to look. They were afraid I would get into trouble. But being the bold U.S. American that I am, I know that "Open house" means that you can look! Apparently the person who was supposed to be attending to the house was gone somewhere and left the most pathetic of dogs to guard the place. The dog was so sound asleep that I didn't even notice him for the first 5 minutes. The houses are three bedrooms, a combined dining/living area (shown in this photo), and possibly two baths. 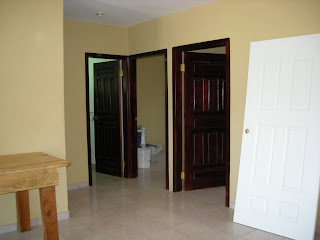 Unfortunately, the master bedroom was locked so I couldn't see how big it was or whether it had a separate bath. The key was in the door but it wouldn't turn. Maybe the attendant was sleeping in there. The kitchen is just impossibly small for a family or even a couple, in my opinion. Many men who design houses here apparently never ask for input from lowly women and consider the kitchen a wasted use of space. The closest gap in the counter space is where the refrigerator goes and the second gap is where the stove will go. There is not an inch of counter space near the sink. The kitchen has approximately 24" of counter space on which to work, most of which will be taken up by the microwave. 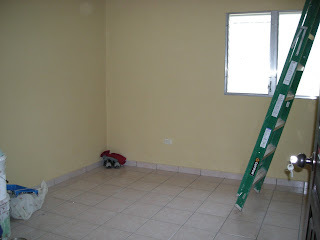 You can see the size of the cabinets and imagine how much space will be left above for overhead cabinets. There is only one electrical outlet showing. Hopefully there is a separate one for the refrigerator as most people who could afford this house would have at least a microwave oven and a blender. This is the entire kitchen. There is about one tile width (12") not showing which is also the walkway to the back door. Kitchens (and garden space) are the main reason that we had to build instead of buying a house. Builders! What are they thinking? 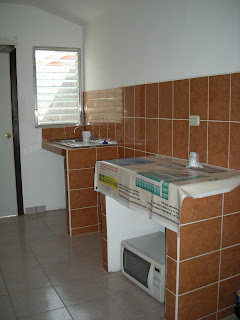 The two bedrooms are about 8' x 8' (2.4 x 2.4 m.), a little smaller actually, judging by the tile. The living area is not a bad size as long as the furniture isn't oversized. 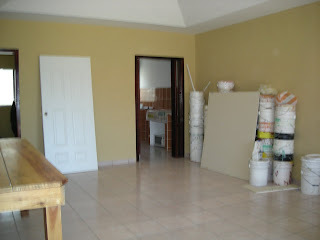 The entire house has a ceramic tile floor and aluminum and glass jalousie windows. 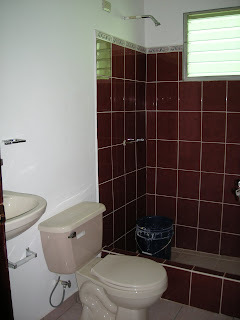 The bathroom includes an averaged sized shower and no storage space. Houses rarely have a bathtub and in the more expensive homes are more likely to have a jacuzzi. 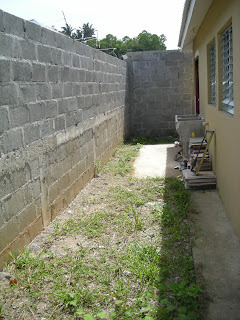 The backyard, which includes a pila for washing clothes, is approximately 6' deep (1.8 m). The front yards will be partly used as a driveway as there are no carports or garages on these houses. The side yards are about 2 1/2' wide (76 cm). 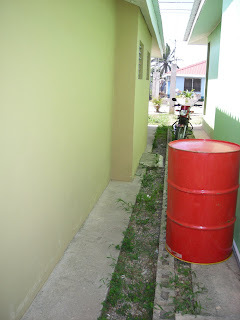 Once the muros are up between the houses (where that row of cement blocks is sticking up), passing through the side yard will be difficult. I have to wonder if the hot pink, bright green, and bright orange houses are also painted the same color inside. We once looked at a very nice, large peach-colored house once and I was amazed to see that every single room in the house was the same peach color. Builders! Men! After seeing the house, I went across the street to speak to some of the neighbors. 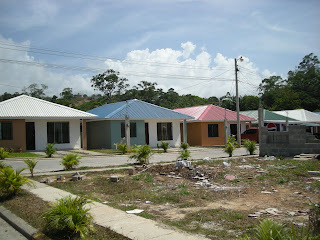 One said that houses were selling for L.700,000 (US $37,000) and another said that they might be L.750,000 (US $39,700). I was surprised. They are nice houses, but the price seems high to me based on the size and the size of the lot. The development is located right on the highway, which makes it good for catching a taxi or bus, but it will also be loud from the traffic noise. "Do you want more information? About the houses. Call by telephone 9-859-1821 with Jiovana." There are several empty lots available. If you buy one, be sure to tell the developer that he owes me a commission. Hah! 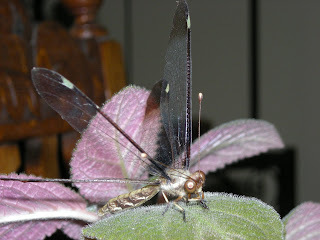 This was a very cooperative dragonfly, posing for pictures inside the house. Who says we aren't in the wild west? Yee-hah!